When the new Fortuner’s April launch happened, it happened with a bang and more than 800 were sold. The launch line-up comprised eight models, including six derivatives powered by the brand-new GD (Global Diesel in Toyota-speak) turbo diesels in either 2.4-or 2.8l guise. Petrol engines were carried over from the previous generation, albeit in slightly revised form, which means a 2.7l four-cylinder and a 4.0l V6, both mated to an automatic transmission. Opt for one of the diesels – you can also specify a new six-speed manual and, if the budget allows, four-wheel-drive to go with it. 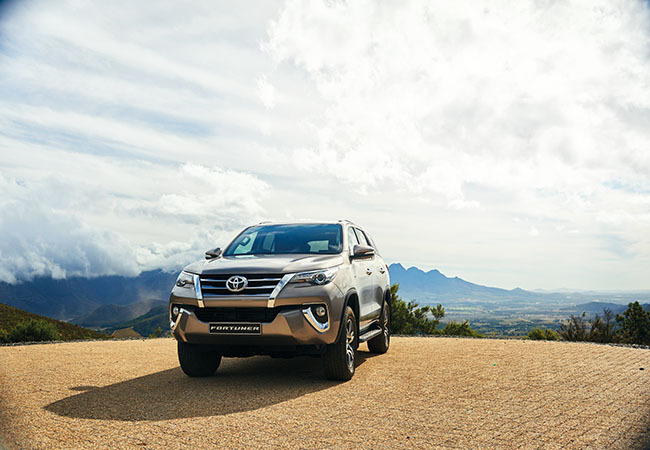 Toyota clearly does not subscribe to a one-size-fits-all philosophy for their middleweight SUV – the range stretches all the way from R429 400 for the 2.7 VVTi Raised Body Automatic to R633 400 for the flagship 4.0 V6 4×4 Automatic. So, there are plenty of options when it comes to drivetrains and trim grades. Also carried over from previous versions is the seven-seat layout, and as before the ‘occasional’ third row folds up against the sides of the passenger compartment (rather than squishing into the floor). Second and third rows are designed for ease of use, with a sliding function for the 60/40-split middle row and one-touch storage ability for all. Often, driving the most basic model of a range line-up reveals the essence of a car. In this case, it’s the 2.4l manual 4×2. 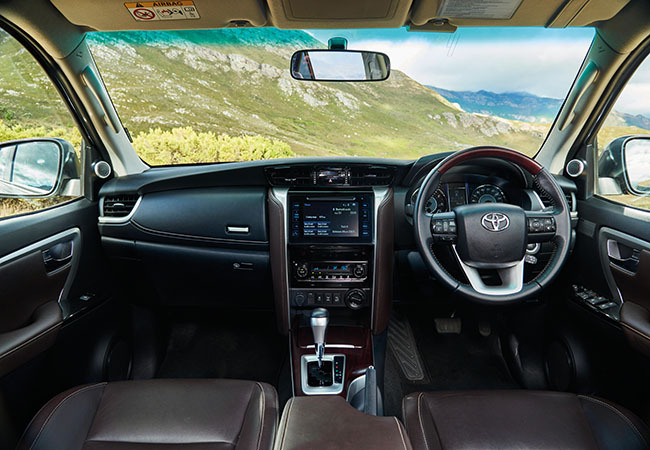 This is hardly bargain-basement, but it does typify the Fortuner: rugged, but with lots of comfort and the ability to take the rough with the smooth. 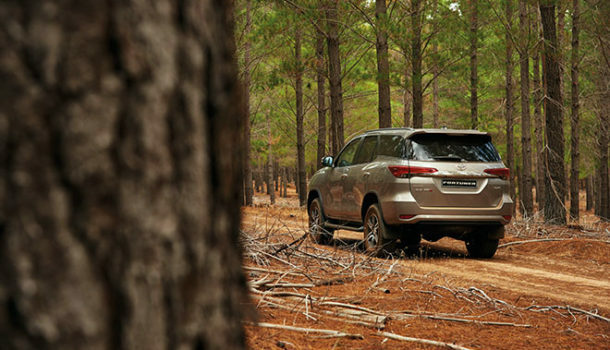 In fact, smooth is what the Fortuner is now all about. Whether it’s the new engine, overall refinement, comfort, or ride quality, this is a family-friendly SUV that’s made a major leap forward. And leap forward it does, thanks to the emphasis on driveability and low- speed tractability. Maximum torque remains at a heady 400 Nm from just 1 600 to 2 000 rpm. That, and the absence of lag, makes it an effortless drive. It doesn’t need to be provoked too often with the gear lever to get the best out of it. Another impressive feature is the 80-litre fuel tank, so refills are going to be few and far between, thanks to overall average fuel consumption of 7 l/100 km for the 2.4 manual. There’s 279 mm of ground clearance – so even the 4×2 models are able to venture easily off the tarmac, a scenario made more appealing by the driver-engaged differential lock. Inside, there are no fewer than three 12V power outlets, and an aux/USB panel integrated in the centre console. Five airbags, including one for the driver’s knees, keep occupants safe. The top-grade models include an additional two. Other convenience features include Bluetooth connectivity, steering-wheel audio and phone controls, and power door locks, windows and mirrors. Air conditioning is standard and features separate air-flow controls for passengers in the second row. Electronic acronyms dominate the safety sheet and, as you’d expect, there are stability and traction control systems. Some of the most welcome additions, though, are Trailer Sway Control (TSC), Hill-start Assist Control (HAC) and Active Traction Control (ATC). TSC uses brake control and engine output control to suppress lateral trailer movement caused by factors such as crosswinds or variable road surfaces. ATC is designed to prevent the wheels from spinning on low-friction surfaces such as mud and snow. It also provides far higher levels of control in off-road situations by distributing torque to the wheels that have traction. Much has changed in the last decade, and the new Fortuner is definitely proof of that. Expect to see many of them on the road during the weekday commute, but more importantly, out and about with family in tow on the weekends.